Evergreen, height 30cm, spread 33cm. 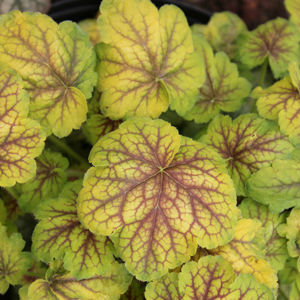 A superb premier Heuchera from the Master Painters series. I am not usually a fan of this leaf colour but I was beguiled by this neat beauty with attractive rich red veining throughout the leaf and very pretty pink-red flowers from mid spring to mid summer. A variety that prefers shade or semi-shade and a fertile, well drained soil. Also great for containers to brighten up a shady spot.